The Buchanan family have a brief but significant presence in the history of Bosbury in connection with the Bosbury House Estate and the Settlements. Robert Buchanan was born in Glasgow on 5th August 1852. After school and working for his father the young man was commissioned in the Glasgow Highlanders. To aid his recovery from an attack of typhoid, he embarked on a sea voyage to New York. The return journey was postponed when he was offered work on a cattle ranch in Texas. 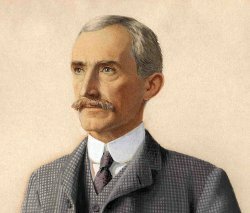 Having made money and enjoying exploring Canada by rail, he returned to New York where he discovered a new corn milling process employing steel rollers. He returned to Scotland and married Jeanie Rae Turnbull in Glasgow in 1879. They had three children, Marie Hardie (Mamie), Elizabeth McCulloch (Bessie) and Jeanie Rae before moving down to Liverpool where, with elder brother William, he bought the Molyneux Mill in Kirkdale in 1887 and installed roller milling. Two sons, Alan and Robert, were born in Liverpool. Business went well and in 1894 they bought a mill in Birkenhead which was renamed the Buchanan Flour Mill. It was run by William and his son Ernest. Robert made his fortune from his Canadian contacts and trading in wheat futures on the Liverpool Wheat Market. He created a network of agents in wheat growing areas worldwide to advise him. Robert Buchanan was a founder member of the 8th (Scottish) Volunteer Battalion of the Kings Liverpool Regiment, formed in 1900. He retired as Major in 1908 at the age of 56 suffering from ill health and in 1910 had an operation for a duodenal ulcer. He bought the 1000-acre Bosbury House Estate in Alans name in 1912 and the family moved to Bosbury. Although he became a Justice of the Peace, Robert Buchanan never settled in Bosbury unlike his family. With a love of outdoor sports, he spent most summers in Scotland and intended Alan to take over the milling business. At the start of the war, both his sons joined the Liverpool Scottish Regiment, which had been renamed the 1st/10th Battalion of the Kings Regiment (Liverpool). Alan died at the first major battle of Hooge, near Ypres, on 16th June 1915. His name is recorded on the Rolls of Honour at Fettes College in Edinburgh where he was a boarder and at Downing College, Cambridge where he studied. After the war, Robert discovered that his younger son was unwilling to take on the business - giving orders to the mill managers, his older cousins, Ernest and Robin - or to manage a large country estate. He approached the Minister of Agriculture and Fisheries and gifted 750 acres to the State for the benefit of ex-officers. The land became known as The Settlements. The family kept Bosbury House together with Home Farm, Townend Farm and about 250 acres of farmland. For his charitable works, Robert was offered a peerage but he refused saying he had given freely with no wish for reward. Robert Buchanan died aged 68 in Pau, France in 1920 after a further operation and his body was returned for burial in Bosbury churchyard. 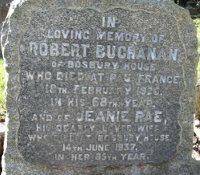 His wife Jeanie died at Bosbury House on 14th June 1937 aged 85 and was buried beside her husband. Sources: Robert Buchanan (1897-1979) Buchanan Family History Part V My Father. This document was supplied to Bosbury historians in 2010 by Peter Buchanan, grandson of Robert Buchanan senior. Census records The family does not appear in the English census of 1881 but in the 1891 census Robert and Jeanie are living at 12, Grist Street, Kirkdale, Liverpool with children Mary, Elizabeth and Jeanie, all born in Scotland. By the 1901 census they have moved to 27, Merton Road, Bootle and have two sons and employ three household servants. Archibald M. McGilchrist The Liverpool Scottish 1900-1919 pub. Henry Young 1930 reprinted 2005. Commonwealth War Graves Commission casualty records. Researched by Barry Sharples, 2011. With thanks to Peter Buchanan.